The Fall Colours, or as I would call it, Autumn Colours Closet does not have many pieces but it’s salmon and reddish tones make a nice change. I would have expected a closet called Fall Colours to have had some orange and gold in it but never mind. I could not find the original shoes for this closet although I am sure they are around somewhere so the girls are wearing shoes borrowed from another closet. Belinda who has the usual Model Muse problems with the older Barbie shoes wears one of my collection of shoes for her shoe size. Diana is first wearing the dress which is made of a tweedy material and the crochet bolero. I had orginally planned to put this outfit on Belinda but I totally failed to get the bolero over her bent arms. I think the two bent arms are the worst of all the Model Muse arm types. 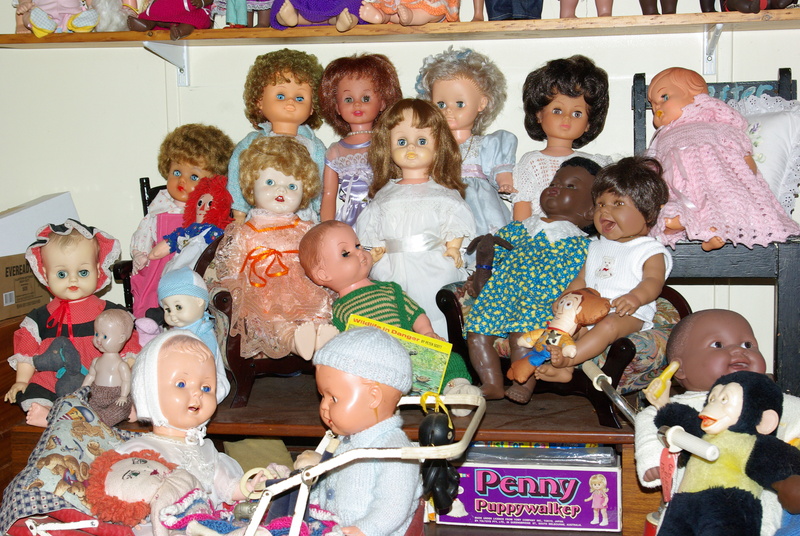 The outspread fingers on all the dolls are a problem enough. Diana in the dress and bolero. Belinda got the denim skirt and the velour top that Diana was going to wear and although the skirt is loose and sits on her hips I think she looks nice in it. Model Muse bodies wear Fashion Fever tops and dresses quite well but sometimes skirts don’ t sit quite right. Belinda in the denim skirt and velour jacket. Last of all is Brittany who prefers the casual look of pants and T-shirt top. I was pleased to find that these pants fit her as the ones from the last closet I featured did not fit her at all. Brittany in brown cotton pans and long-sleeved T-shirt. The girls posed on the couch again after the shoot. The girls in their outfits. Previous Time for a Makeover? You are right. If these are meant to be autumn outfits they are for someone who does not plan on going outside. Or someone living in an area of summer climate autumns, lol. Neverheless it is another great FF closet. I still prefer the outspread fingers over the “paddle” hands some of the newer dolls have. If a garment promises dressing desaster, like that cardigan, I put a little plastic bag over the doll’s hand, slip the garment over it and pull out the plastic bag when done. May be this would work for you as well. Oh that’s a really good tip. I’ll try it. I do agree that the outspread hands are more realistic looking I just get exasperated with them catching things but your idea would solve that.